Stockholm Syndrome; It's Why American Workers Refuse To Divorce Themselves From Capitalism. You are here: Home / Money / Business / Stockholm Syndrome; It’s Why American Workers Refuse To Divorce Themselves From Capitalism. Stockholm Syndrome; It’s Why American Workers Refuse To Divorce Themselves From Capitalism. (ThyBlackMan.com) At this moment, my student’s reaction to viable alternatives to American Capitalism is so predictable that I’ve considered not discussing important issues and figures like Karl Marx, Socialism, Communism, and Communist Party USA, each an essential part of the Great Depression Era, in my U.S. survey course. I am astounded by how little my students know about societal formations and the endless possibilities that appear when a group of politically astute people joins forces. History dictates that it is this force that possesses the ability to change the world in a significant manner. Far too frequently, I am encountering students whose pursuit of “things” dominates any larger understanding of what makes a life worth living. The alluded to students have managed to mimic the materialism of previous generations and unfortunately linked their self-worth with designer labels that they proudly adorn their bodies in a manner eerily reminiscent of an enslaved person who has been branded by some cruel owner. Far too many of my students are unfettered “ends-justify-the-means” Capitalists who believe that “securing the bag” will solve problems that have nothing to do with finances. Many people believe that “the securing of the bag” will be sufficient to pay the harsh tax that comes with being Black in America. If the current edition of young Black America studied those that came before them, they would discover that they are not the first generation to mistakenly believe that a financial increase will solve the large problems facing our people. It is a peculiar situation to hear undergraduate collegians, as well as many past their collegiate days, express pervasive financial struggles without considering viable alternatives to economic cooperation/collectivism. A long-ago conversation with a trusted friend who occupies the same Democratic Socialist political stance as me likened the continuing allegiance of poor and working-class workers to Capitalism as a form of Stockholm Syndrome — a condition that causes hostages to develop a psychological alliance with their captors as a survival strategy. 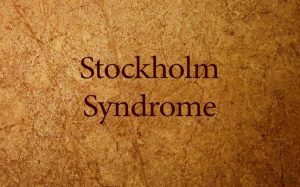 In many ways, Stockholm Syndrome is a reasonable diagnosis that explains the continuing allegiance of American workers to unfettered Capitalism. Just consider for a moment that American workers can trace the vast majority of their suffering to the unfair labor practices of a greedy, avaricious ownership class that has repeatedly proven that their impulse to exploit workers knows no end. American workers cannot seem to break the hold that owners have on them. Unfortunately, instead of fighting against what has become historic exploitation, non-elites have unscrupulously decided to adopt the priorities of their exploiters and made unfulfilled plans to find individuals that they could exploit for financial gain. Most educators realize that the “highs-and-lows” of teaching hinge on the development or refusal of students to learn “how” to think, instead of “what” to think. A solid argument could be constructed that the foremost failing of the American educational system is most evident in successive generations of American workers inability to understand “how” to think as their failure to mobilize for worker rights is a telling sign that they are at best confused regarding ‘What American workers should think and what they should be doing.’ I find no solace in the fact that my students have much company in their inability to understand and move toward positively addressing substantive matters surrounding the convergence of class, labor, and economics. If nothing else, it does give educators such as myself yet another opportunity to lift the minds of non-elites regarding their continuing exploitation. It is a job, I guess. One that I have tired of doing. This bit of communist propaganda didn’t work for Plato ( Plato’s Republic ),Marx and Engels, ( Communist Manifesto ), China, Russia,the Middle East and any other parts of the globe north, and south of the equator. Americans believe in an unequal distribution of available goods, and services based on merit, thus, a medical doctor merits more money than a cook, a senator merits more money than a trash collector, and a registered nurse merits more money than a nurse’s aide. More money means more access to the things sold in the market places. Americans like to own things like houses,automobiles,jewelry, etc.A love of capitalism,and for the ownership of private, and real property isn’t a manifestation of a collective Stockholm syndrome. It is the American way.